We have 3 daughters, ages 9, 6 and 5. 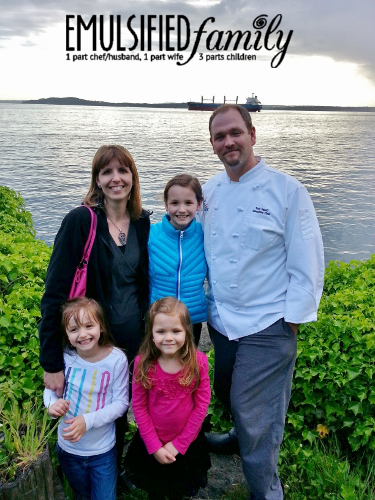 What has been the hardest part for you and your chef/husband with the addition of a little one to your family? Finding time to talk, without kids around, has also been a challenge, although not until our oldest was old enough to listen in and care what we were talking about. Before then it wasn’t a problem. What would you consider the pros and cons of staying home full time? No matter when my chef/husband is off, I’m around to see him. I have time to meal plan and take care of our home. There are unlimited hugs and slobbery kisses throughout the day and night. If I’m up a lot with one of the kids and tired the next day, I’m at home and don’t have to worry about trying to work on 2 hours of sleep. It’s still not easy though. I enjoy time with friends and their kids during the day. I am able to go to workout and midweek Bible Study during the day at church with my kids. 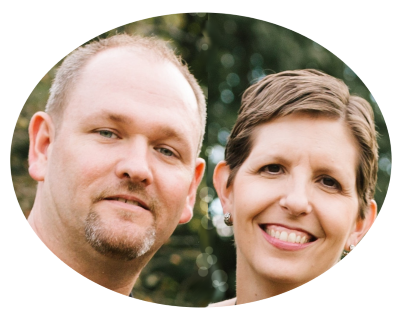 Limited income – lots of sacrificing and going without. No adult to talk to during the day, often resulting in me talking my poor chef/husband’s ear off when he calls or gets home and is exhausted. Having too much time to think because I’m home so much. This often leads to me worrying about things, unfortunately. 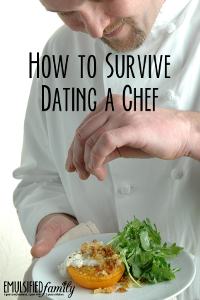 Any advice for young chef couples who are thinking about starting a family? Well, I do have some advice. I didn’t think I had that much until I sat down to write. Please don’t think that by writing this advice my husband I are are prefect and have everything figured out. We don’t. But we have learned a few things from our mistakes in the past 9 1/2 years, so that’s why I share what I do below. I’m not going to hold back or sugar coat it. Just warning you in advance . . . Your husband needs to come before your kids. After God, he needs to be #1 in your life! Don’t neglect your relationship with God and don’t neglect your husband just because you have children. As you are at home with the kids, sometimes frustrated and needing a break, and of course working on not being bitter toward your husband for working long hours, remember your husband would rather be at home with his family instead of at work. (If that’s not the case, you need to do everything you possibly can to make your home a place he wants to come home to. Fight for your marriage and your family with everything you have in you!) I know it’s not easy for my husband to work so many long hours and miss so many things at home. It’s easy to focus on myself and how hard things are at home that I often forget that it’s just as hard for him, if not harder. Without his job, we wouldn’t be able to pay our bills and we would be sleeping in a tent in his parents backyard. And while my kids would probably love that for a few weeks, I like having a home and being able to pay our bills. So while he wishes he could be home more, he works hard to provide for us. Never forget that and let him know regularly how much you respect him for his hard work and devotion to your family. 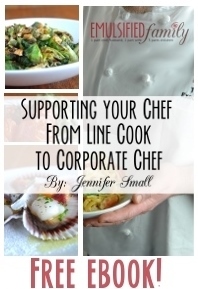 Stop reading right now and send your chef/husband a text thanking him for working so hard to provide for your family. Go ahead. I’ll wait. Make sure to take care of him. Help him with his chef coats, pants and aprons, make sure there is Top Ramen in the cupboard and Gatorade in the refrigerator for him when he comes home (or whatever he enjoys after a long day in the kitchen). While your children are important, your husband needs to come first. One day your kids will leave the home, but your husband will still be there. Don’t neglect your marriage. Make it a priority. Marriage is not easy and you have to work at it. Don’t let your kids stop you from doing that. Please don’t think we have the perfect marriage, that I am a perfect wife and mother or that my chef is the perfect father and husband. That is far from the truth. I struggle daily with creating a peaceful and quiet home for my husband to come home to (or to leave from on most days). I often forget to grind coffee for the next morning, or I get behind on laundering his chef coats. We are not perfect and fail often. But I will never give up and will continually try to make our home a place my chef/husband wants to come home to. Moving on . . . You are going to do most of the parenting because of the hours your chef/husband works. The sooner you accept that and stop being bitter about it, the better. If you don’t think you can handle that, just enjoy being an aunt and love on your nieces and nephews. I know that might sound harsh, but bitterness toward your husband will kill your marriage. And adding kids to a marriage where you are bitter at your husband all the time . . . need I say more? Put your wife before your kids. After God, she needs to be #1 in your life! Don’t neglect your relationship with God and don’t neglect your wife just because you have children and work a crazy amount of hours. Love her, listen to her, cherish her, encourage her and help as much with the kids as you can when you are home. If you don’t know how to help and feel helpless because you don’t really know what goes on during the day when you are usually at work, that’s OK. Ask how you can help. Taking care of children and a home all day without much help is a lot of work. I know it’s totally different than what you do all day in the kitchen, but when she calls you and talks for 10 minutes straight, just remember she’s been stuck at home with the kids all week (in the rain and without a car) and listen to her graciously. You might even be able to relate and start laughing as her day might sound much like yours except your “children” were in their 20’s instead of preschool. Your friends are important, but not as important as your wife and child. While it’s important to be able to have time to yourself and some time with friends, your family needs to be the priority. When you become a father, you will have less time with your friends after work than you did before. Sorry to break the news to you. Don’t be bitter about this, but enjoy the time with your family. Invest in your marriage and your children. Show your friends what it means to be a good husband and father by spending time with your family and taking care of them. Was about to send the text when I read your note to send a text. That made me chuckle. Loved this.